St. Ephraim (d. 373) of Nisbis, Mesopotamia, despite being the son of a pagan priest, became Christian and was baptised. His surviving written works are extremely numerous, many of them in verse. This manuscript belonged to the Augustinian Abbey of Bristol, as shown by several flyleaf inscriptions ('Liber sancti Augustini Bristolie'). 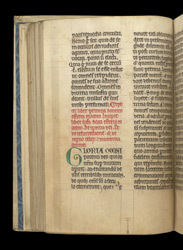 This page has the end of one of Ephraim's sermons and the start of a second, marked by a green initial 'G'. At the bottom edge of the leaf is an unusual form of place-marker: a very narrow strip of parchment has been cut vertically and then folded horizontally through three small slits.